With this collection of photographs, ethnographic film, textiles, musical instruments, artifacts, and intimate descriptions of people and places, beliefs and activities amassed by Victoria Vorreiter and on display here at Tamarind Village, it is hoped that you, our guests, can begin to appreciate the wonder,integrity, wisdom, and astonishing beauty inherent in Hmong culture. Every piece, every gaze has a unique story, one that is integrally related to the whole Hmong legacy. Passed down through generations over untold ages with little if any alterations, the distinct melodies, rhythms, and themes of secular and sacred music and the varied colors, motifs, styles, and techniques of Hmong textiles serve as a living link, a time capsule that recalls the first ancestors and speaks to present generations. Regrettably, however, the music, rituals, textiles, and traditions that harmonize the inner and outer life are vanishing as wise elders pass away and young generations adapt to an ever-changing, modern world. It is hoped, then, that these archives may serve as an inheritance for the Hmong and for humanity, to remind and inspire us all. Khaws cia rau nruab siab. Collect and store in the center of the liver. Cim tseg rau nruab plawv. Remember deeply in the center of the heart. Hmoob tug cag txuj thiaj li yuav tsis pawv. So Hmong roots of knowledge will not disappear. Victoria Vorreiter’s life in music has taken on several forms - as a violinist, orchestral player, instructor at music schools and universities, and guest lecturer at conferences around the world. This immersion in the sonic environment inspired her present passion and lifework: to explore the traditional melodies and rhythms in cultures where music and ceremony are the primal source of collective memory. In 2005, Victoria settled in Chiang Mai, Thailand, to document the music of the Golden Triangle, a geographical and historical crossroads home to more than 130 groups and subgroups. 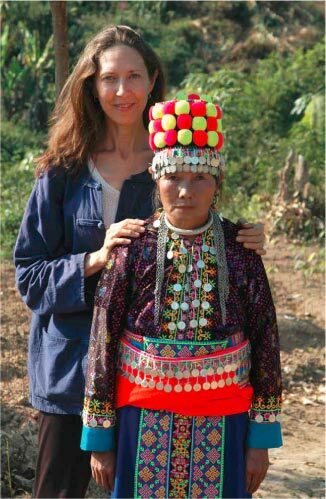 For over a decade, she has trekked to remote mountain villages to record the traditional secular and sacred music of the indigenous peoples through films, photographs, recordings, journals, and collections of instruments and textiles. She has woven this large body of work into the Songs of Memory Project, which appears in a variety of forms: books, compact disc, ethnographic films, photographic exhibits, and the Songs of Memory multi-media museum exhibition. For the past six years, Victoria has specifically explored Hmong culture through its rich trove of oral traditions and textiles. This has culminated in a comprehensive collection of integrative archival materials - Hmong Songs of Memory book and film, photographs, and comprehensive collections of Hmong instruments,artifacts, and clothing. It is a joy and honor to share the fruits of this labor with you in the Hmong Songs of Memory, Hmong Threads of Life exhibition. The Hmoob (Hmong), one of the major ethnic groups of Southwest China and Southeast Asia, have developed through untold generations an astonishingly complex and rich culture where all facets are highly integrated - their social structure, communal mores, spiritual beliefs, handiwork, textiles, oral tradition, and music. Life lessons echo in songs. Nature is traced in embroidered patterns. It is likely that Hmong ancestors originated in Siberia and Mongolia, as recounted in Hmong songs and legends. Over millennia, they gradually moved from mountain summit to summit along the Yellow River, into the heart of Central China before 2000 BC. Eventually the Hmong settled in the highlands of what are now Henan, Hubei, and Hunan Provinces, where they thrived. After the Han Dynasty, 25-220 A.D., the Chinese spread into this area with the intention of ruling all inhabitants, an ambition that provoked centuries of conflicts. By the 1700s, the Hmong were finally forced to migrate to the lower reaches of the Yangtze River, in the southern Chinese provinces of Guizhou, Yunnan, and Sichuan, where the majority currently lives. Some Hmong groups, however, continued their journey south, relocating to northern Vietnam, Laos, Thailand, and Myanmar in successive waves. Hmong households are composed of multi-generational, extended families related by descent and marriage, where special emphasis is placed on a hierarchy determined by age. Hmong society maintains a system of eighteen patrilineal clans, some of which are further divided. This clan system provides order to all social, political, economic, and religious interactions. The Hmong of Southeast Asia are composed of numerous groups and subgroups, speaking a range of regional languages. The four major dialects correspond to the largest of these groups, so named by the primary color of their garments - the White Hmong, Hmoob Dawb; Blue or Green Hmong, Hmoob Ntsuab;Striped Hmong, Hmoob Txaij; and Black Hmong, Hmoob Dub. Despite such diversity of vernacular and customs, the Hmong find commonality in the shared tenets that permeate their songs, stories, and ceremonies.